There really was no feasible way I could search every inch of the state for the most beautiful, unique, and amazing homes in the entire state. But I sure gave it a lot of thought. The only real criteria was that the home be historic and unique, so I looked to the National Register of Historic Places to help narrow it down. I tried to use a good cross-section of different styles, sizes, shapes, and colors, and it was not an easy task. But here are HighwayHighlights’ Top 50 Coolest Houses in Minnesota. 50. 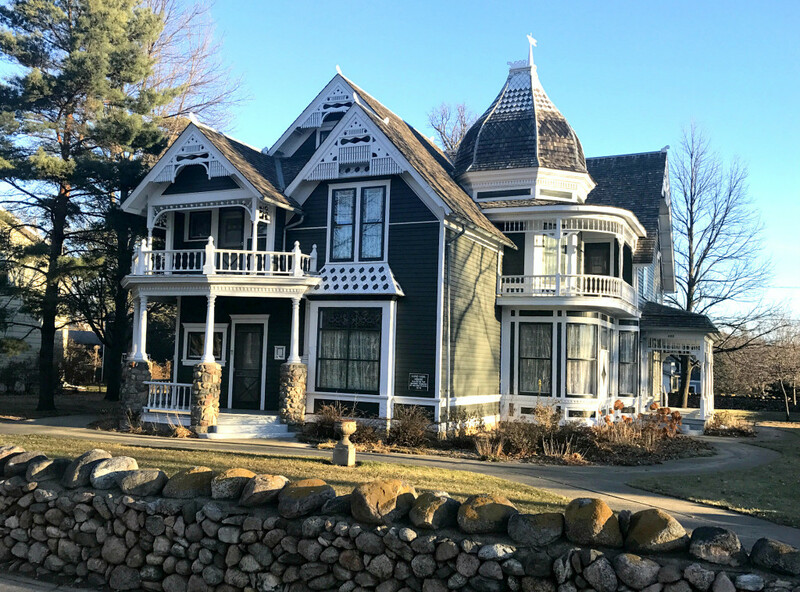 Comstock House, Moorhead – Our top 50 starts with a Queen Anne/Eastlake-style house in my hometown built by US Congressman and businessman Solomon Comstock in 1883. It is operated as a historic house museum as a partnership between the Minnesota Historical Society and the City of Moorhead. I remember taking a tour of this place on a school field trip as a youngster and any sense of significance was completely lost on me. 49. 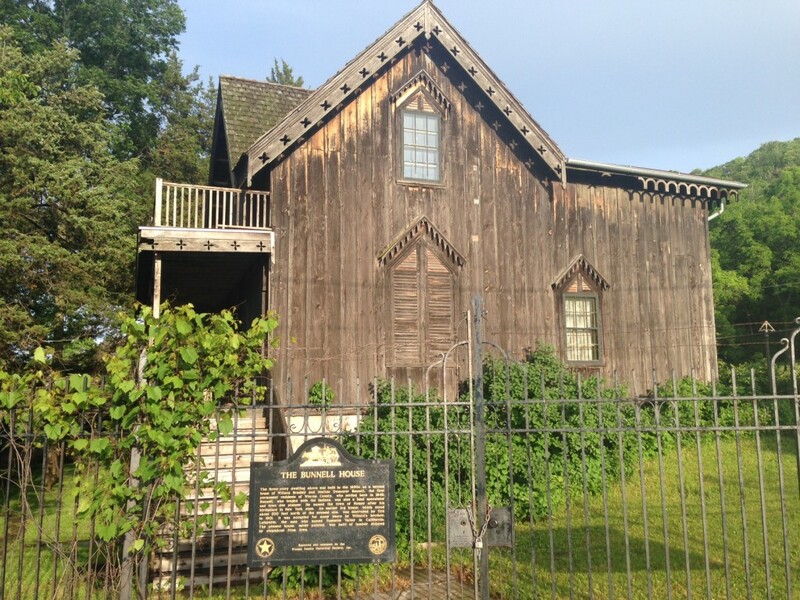 Cyrus Cobb House, White Bear Lake – North of St. Paul is the Cyrus B. Cobb House in White Bear Lake. 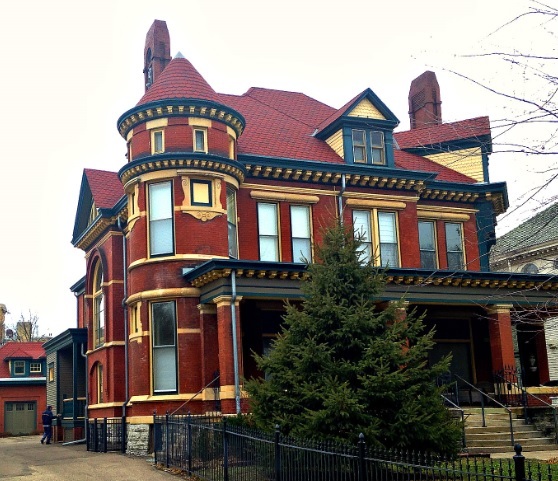 This Queen Anne style brick Victorian home was built during 1885-1889 for a local businessman. 48. 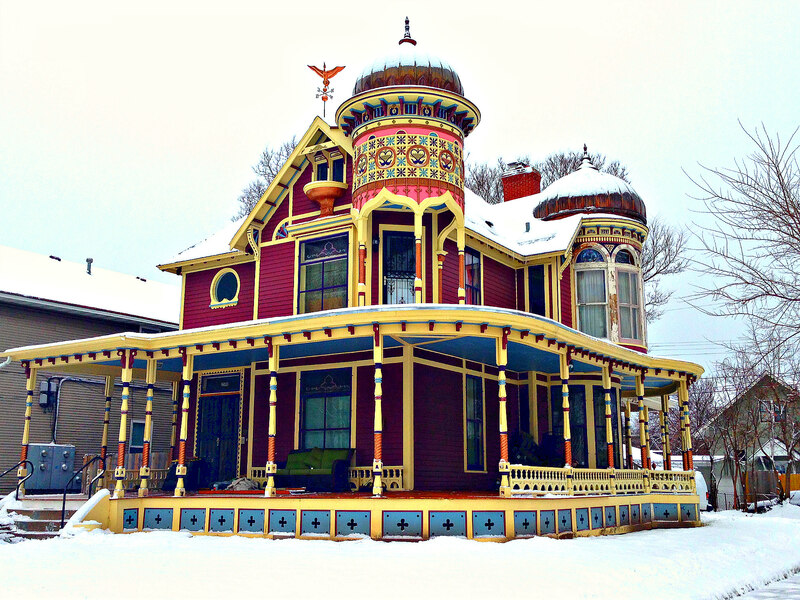 Wanda Gag House, New Ulm – Colorful, Bohemian, and completely whimsical, the Wanda Gag House in New Ulm has been restored to its original splendor and is available to tour as a house museum, like many other homes in our top 50. Gag was a successful children’s book author who penned the classic tale Millions of Cats. 47. 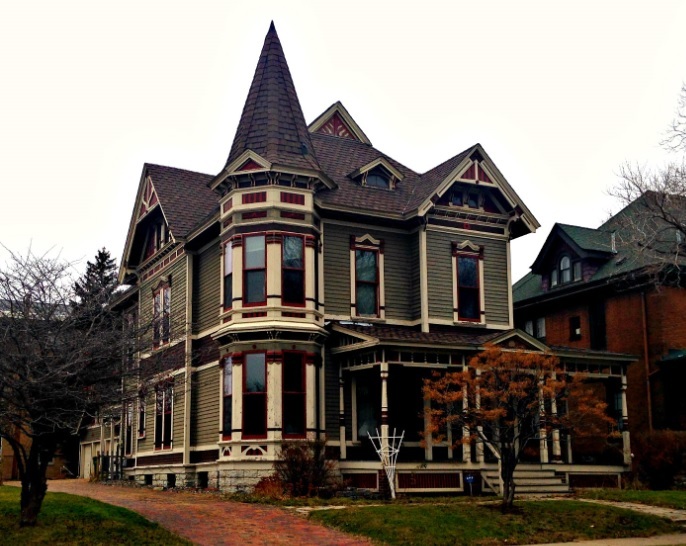 Theodore Sheldon Mansion, Red Wing – Red Wing’s historic district is filled with some beauties, but the Theodore Sheldon Mansion just might take the cake. It was built in 1875 by Theodore B. Sheldon, an early settler of Red Wing who arrived in 1856 and became one of the city’s leading citizens. 46. 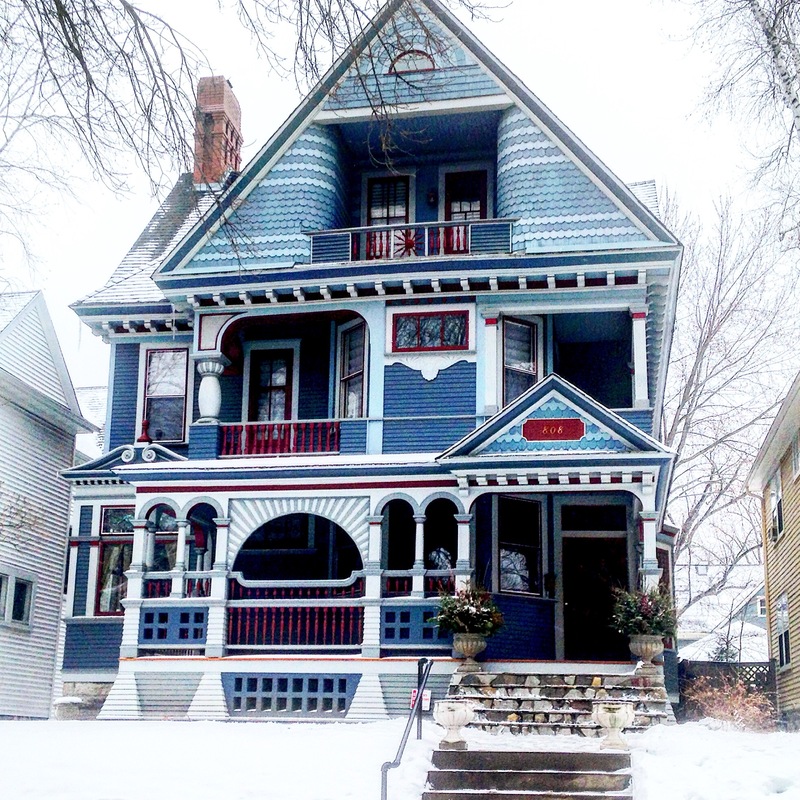 Adolf Muench House, St. Paul – This Queen Anne home overlooks downtown St. Paul in a cul-de-sac just north of the interstate in an urban, working-class St. Paul neighborhood. I love the pointed dormers and colors of the trim on this one. 45. Harry F. Legg House, Mpls – Located in the Elliot Park neighborhood just south of downtown Minneapolis is the H.F. Legg House, a pinkish-colored Queen Anne Victorian house that has been altered very little since it was built in the late 1800’s. 44. John G. Lund House, Canby – Another historic-house-turned-museum, the Lund-Hoel House in Canby was the late 1800’s Victorian home of a leading local citizen of Canby, John G. Lund. It features quaint yet elegant decorations and a stone fence around the perimeter. 43. 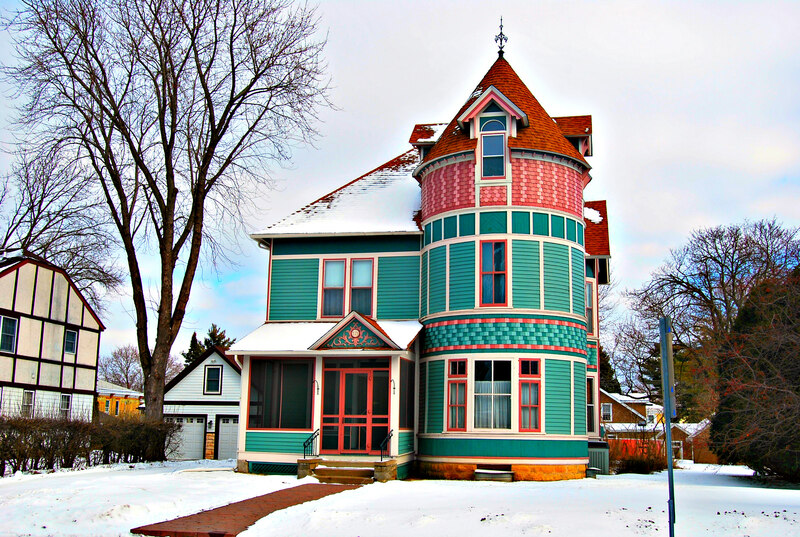 Emily and Stephen Schumacher House, St. Peter – This beautiful Queen Anne home in St. Peter was built in 1887 for a local merchant named Stephen Schumacher by a notable architect out of Mankato. It suffered tornado damage in later years and was restored with help from the Minnesota Historical Society. 42. 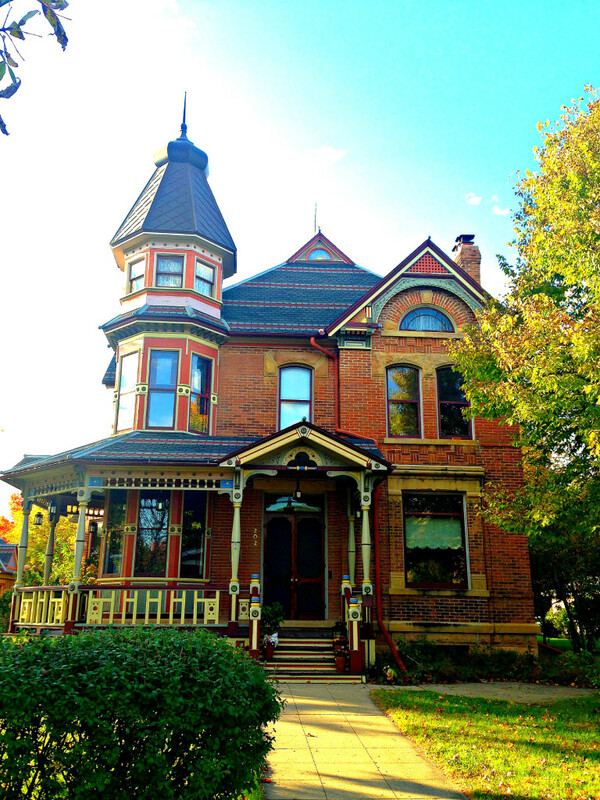 Rau/Strong House, St. Paul – This beauty in St. Paul’s residential West Side neighborhood features Italianate, Second Empire, and Eastlake-Movement architecture all in one. If you don’t know what those are, that’s okay. You can just enjoy the shape and color of it too. 41. 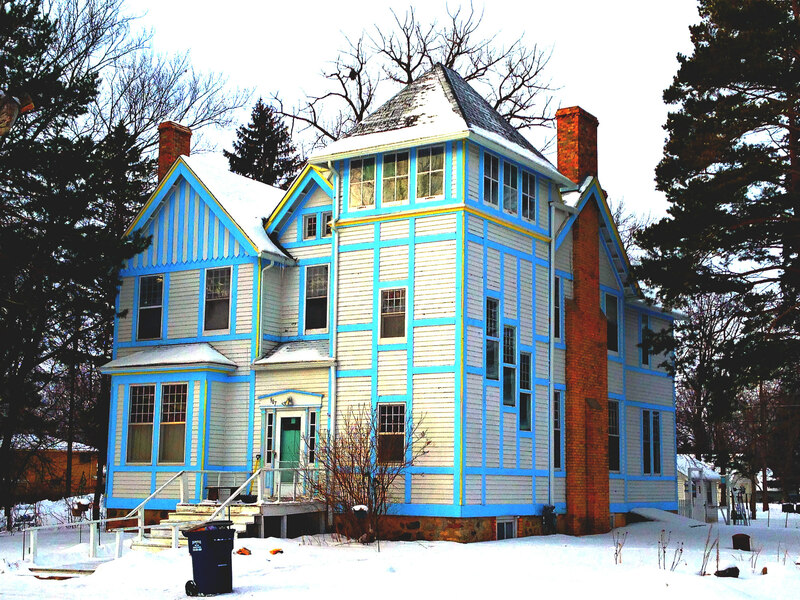 Lewis H. Stanton House, Morris – A “Stick-Style” house commonly referred to as “The Chimneys,” the Stanton House in Morris features blue timbers and shades of Tudor-Revival style anchored by its two twin chimneys. 40. Foley-Brower-Bohmer House, St. 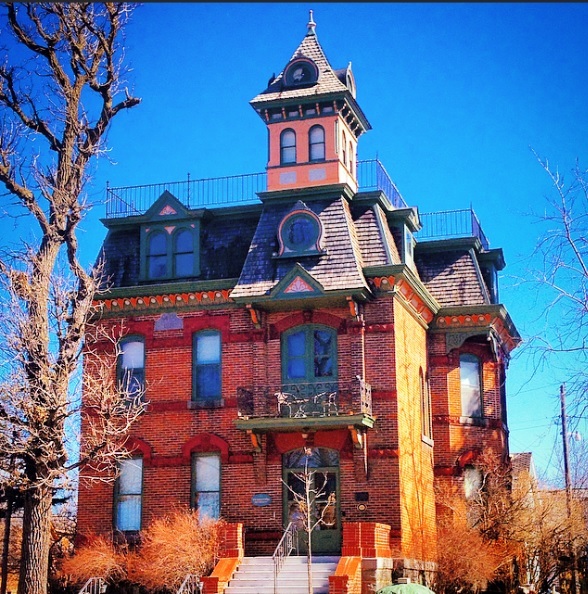 Cloud – The magnificent Foley-Brower-Bohmer House was built back in 1885 in the Richardsonian Romanesque fashion, and was once considered the finest house in St. Cloud. In later years, it suffered abandonment, a fire, vandalism, unauthorized replacement of windows (leaving some boarded), a botched restoration attempt, and later, foreclosure. It’s currently empty and for sale. 39. Almond A. White House, Motley – It’s hard to imagine that quiet little Motley, MN, would be hiding such a marvelous gem of a house. The A.A. White House, hidden just out of view off of the main highway through town, features notable Queen Anne architecture with a four-stories-high turret. 38. 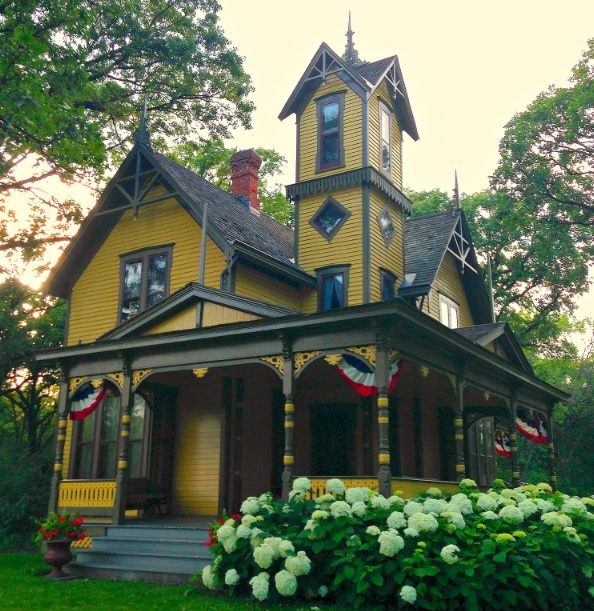 Patterson-Hernandez Home, Barnesville, MN – Barnesville (not Burnsville), is a small prairie town outside of Moorhead, and home to an incredible Queen Anne home built out of fieldstone from surrounding farms. The house sits on the edge of town in the otherwise sleepy Red River Valley. 37. 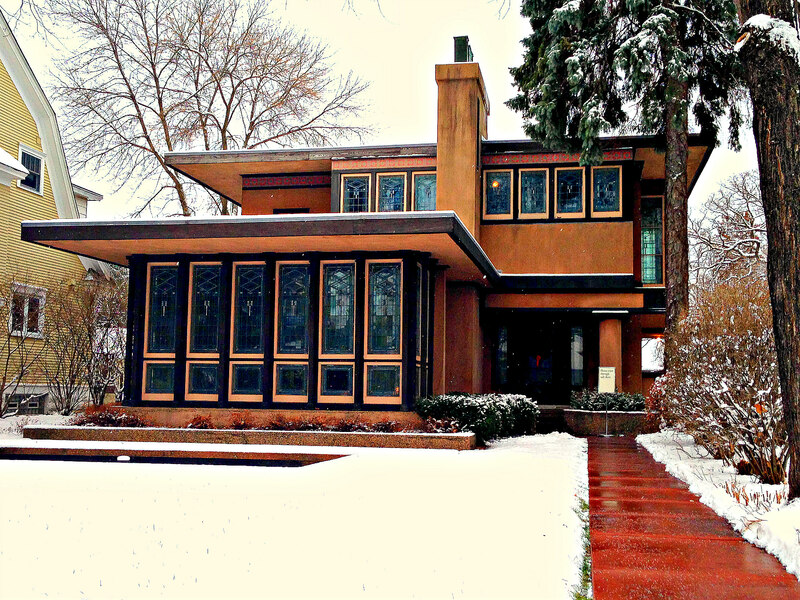 Lindeke House, St. Paul – I could have done a top 50 with Summit Ave homes alone. 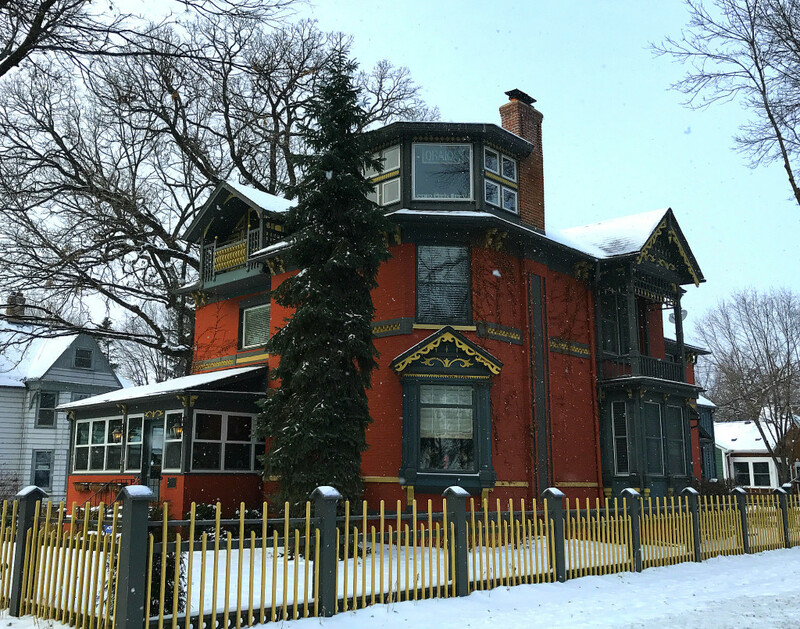 St. Paul’s Summit Ave district is home to the largest concentration of Victorian homes in America, and almost every one is different and beautiful in their own way, like the Lindeke house at 295 Summit Ave. It was built in 1885 for Albert and Carol Lindeke, who owned a large dry goods store in downtown St. Paul. 36. 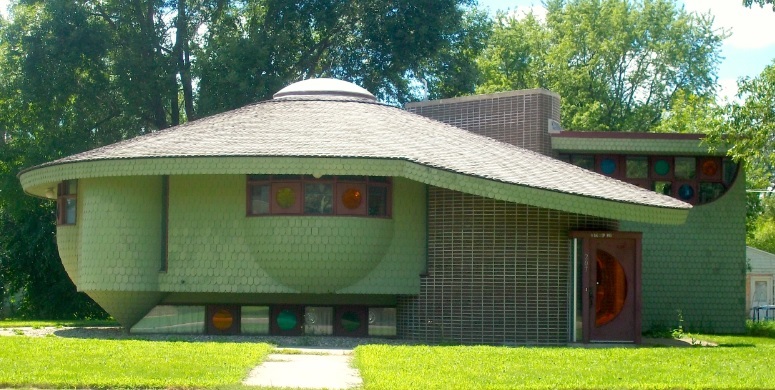 Michael Majerus House, St. Cloud – The Majerus House is a gorgeous French Second Empire-style home in St. Cloud’s historic homes district south of downtown. It is currently a B&B, like many others on this list. 35. 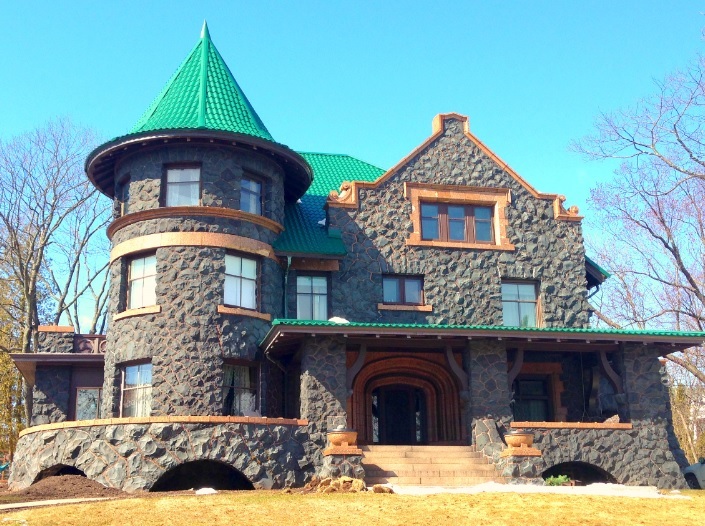 Henry Myers House, Duluth – One of the countless beautiful homes in Duluth’s mansion district, the Henry Myers House features dark basaltic stones contrasted by tan and green trim and a large, imposing turret anchoring the left side. 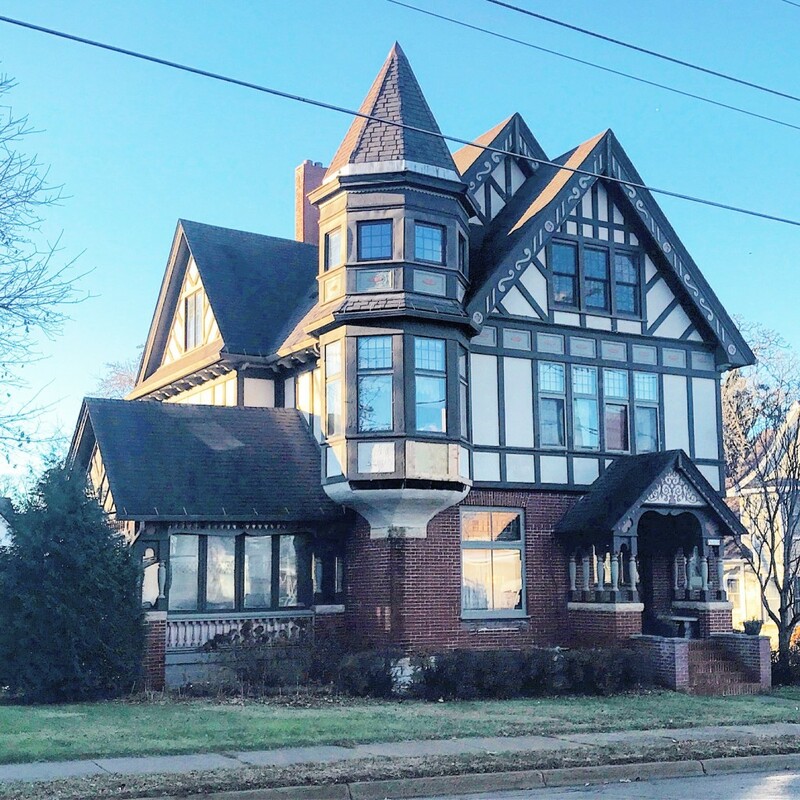 The house dates back to the early 1900’s, where an Ohioan investor by the name of Henry Myers moved to Duluth during its boom period. The home recently received a much needed update in 2013. 34. Governor’s Mansion, St. Paul – Originally known as the Horace Hills Irvine Mansion, the current Governor’s Mansion on Summit Avenue has twenty rooms and was designed in the Tudor Revival style of architecture. It was built by famed Minneapolis architect William Channing Whitney who also designed many beautiful mansions in the Washburn-Fair Oaks neighborhood of Minneapolis. 33. 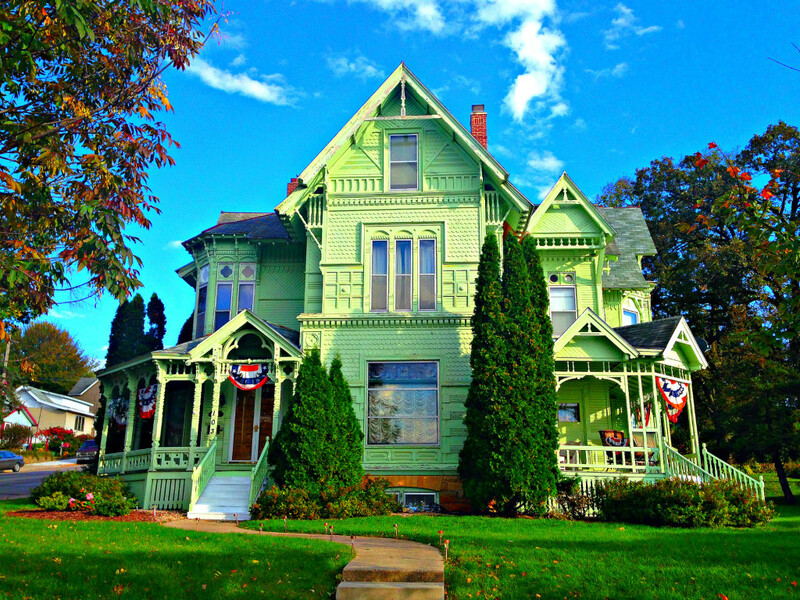 119 Chestnut St, Stillwater – Probably the most beautiful town in Minnesota, Stillwater is home to blocks and blocks of Victorian homes overlooking the St. Croix River Valley. This multi-colored beauty on Chestnut Street, sometimes referred to as the “Anderson House,” is without a doubt one of the best. Like many on this list, this historic home once fell badly into disrepair and was eventually restored by an old house enthusiast and attorney named Anderson. 32. 2017 E Superior St, Duluth, MN – Sometimes known as the “Bunnell Mansion,” the stately home on Duluth’s Superior Street was the home of the founders of the Duluth Herald newspaper built around 1908. 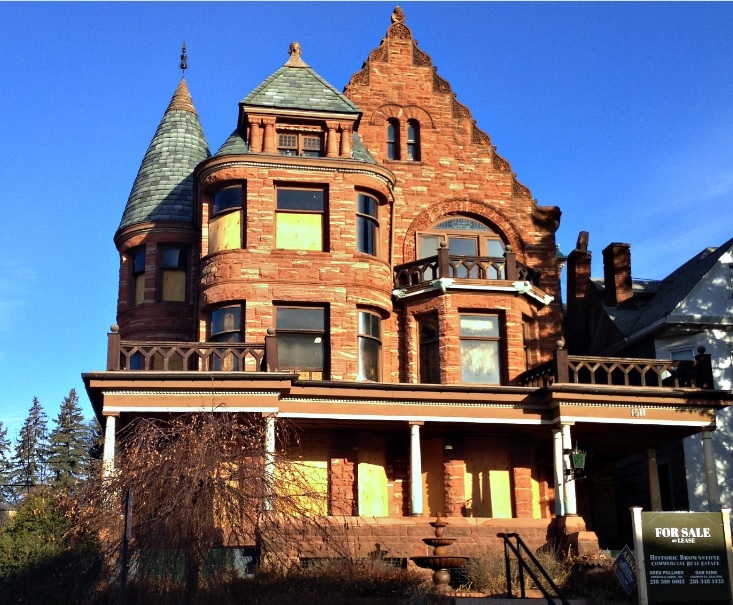 It exhibits Renaiassance-style architecture similar to Duluth’s Glensheen Mansion. 31. Jacob Harder House, Mountain Lake – Half-spaceship, half-Frank Lloyd Wright, this earthy, organic, futuristic abode was built in 1971 by famed architect Bruce Goff, who also designed another equally bizarre house outside of town which was later destroyed by fire. The house is currently a private residence in the unassuming, quiet town of Mountain Lake. 30. 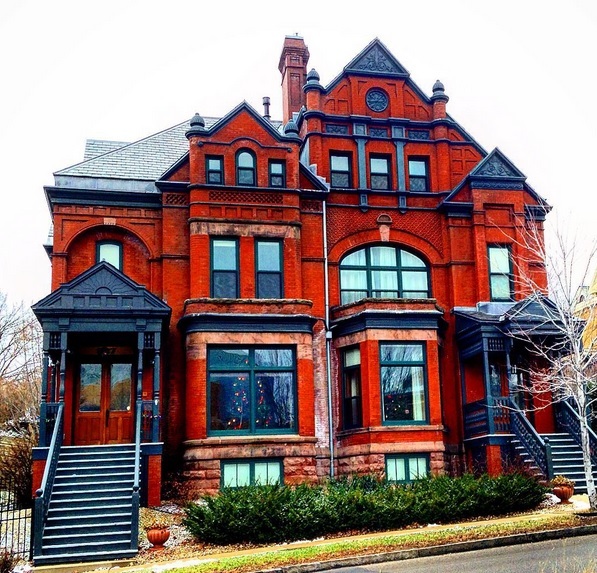 John M. Armstrong House, St. Paul – The Armstrong House in St. Paul is a beautiful, red-brick, Queen Anne-style mansion located near downtown St. Paul by the Minnesota Science Museum. It was actually moved to its present location on St. Paul’s Eagle Parkway in 2001 from West Fifth Street. 29. 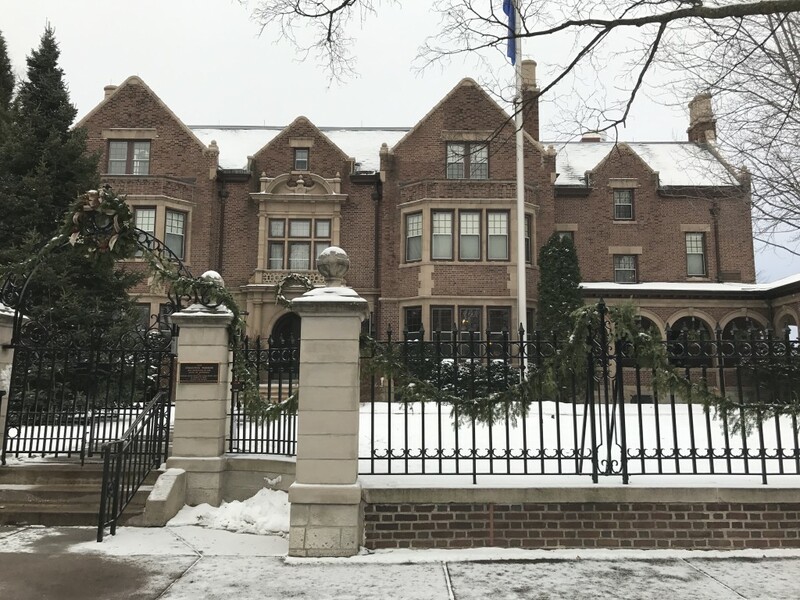 Van Dusen Mansion, Minneapolis – The Stevens Square neighborhood in Minneapolis is packed full of character, and the Van Dusen Mansion on LaSalle Ave is no exception. The home’s original owner, George Washington Van Dusen, was an entrepreneur who founded Minnesota’s first and most prosperous grain processing and distribution firm in 1883. 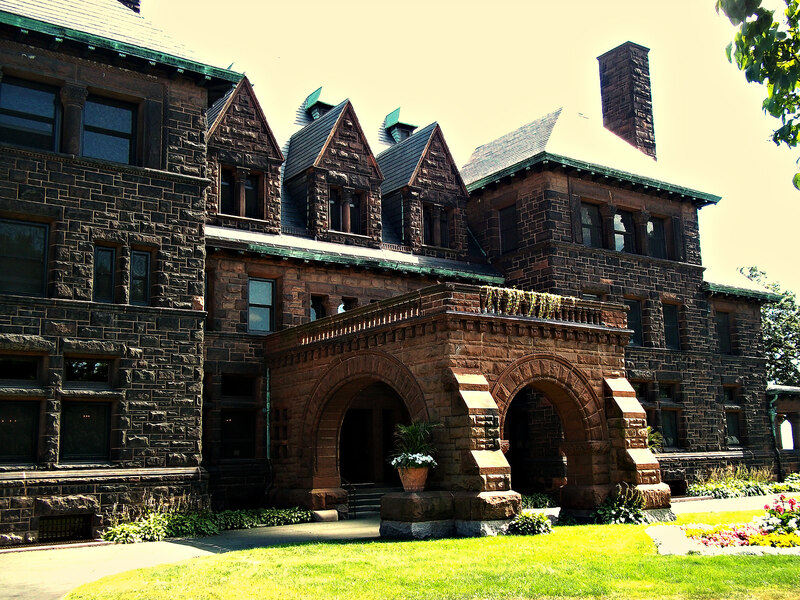 The mansion’s architecture is Richardsonian Romanesque, and the brick was quarried locally in Minnesota. It currently can be rented out for events. 28. Ward Beebe House, St. Paul – The Dr. Ward Beebe House in the West Summit Avenue Historic District in St. Paul is a three-story, stucco house built in the Prairie School style of architecture. 27. 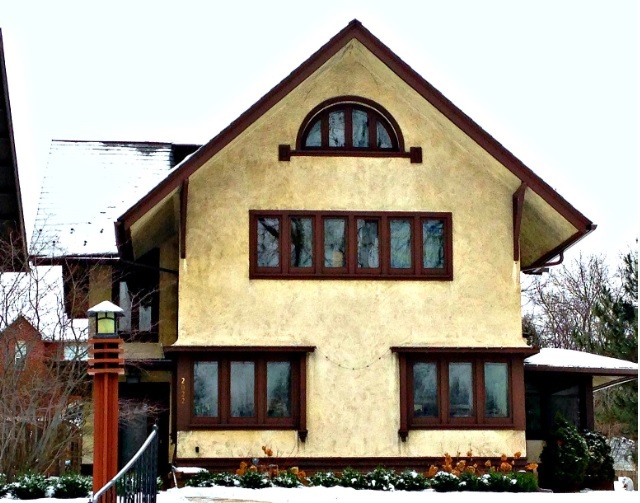 Olaf Lee House, St. Paul – This little gem is found in a somewhat nondescript, residential, working-class St. Paul neighborhood and exhibits a combination of Swiss Chalet and Craftsmen Architecture. 26. 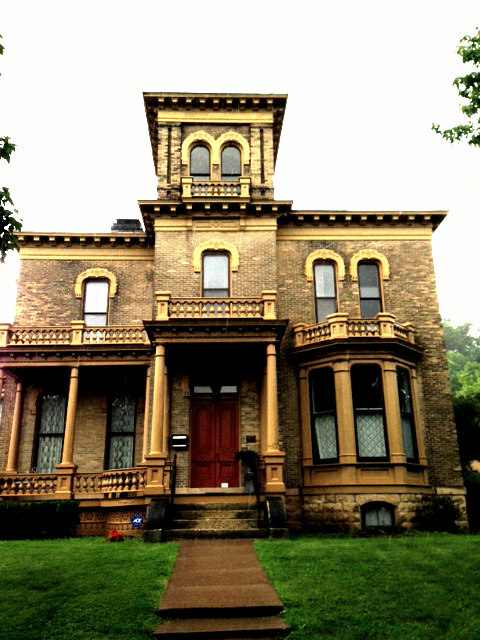 Oliver Traphagen House, Duluth – The Traphagen House in Duluth is a significant example of Victorian and Romanesque architecture made with locally quarried sandstone. Oliver Traphagen designed a number of other homes in Duluth; and Chester Congdon, the owner of the famous Glensheen Mansion (#12), actually lived in this house prior to Glensheen. Upon my visit in spring of 2015, the Traphagen house was vacant, foreclosed, and had sadly suffered severe vandalism and fire damage. The windows were all boarded up and there were signs out front warning against trespassing. 25. 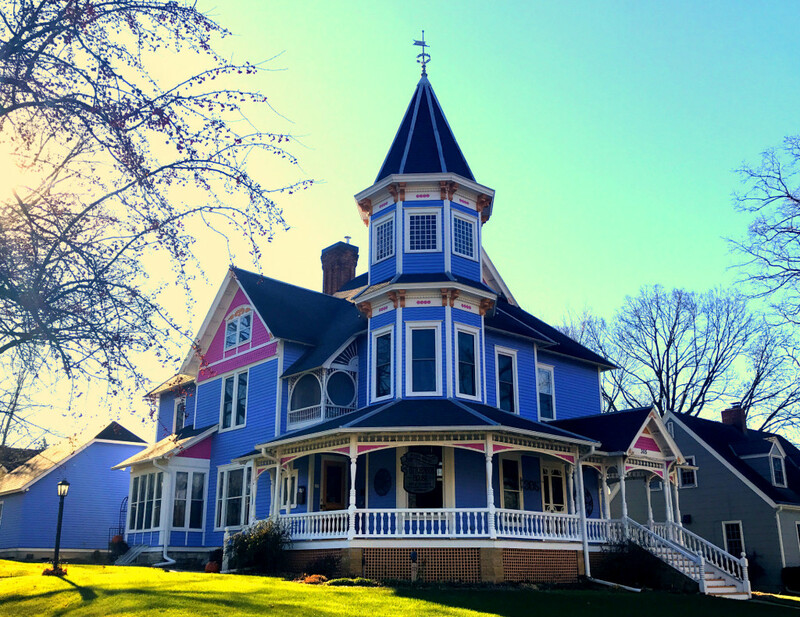 Stillwater, MN – This unnamed Stillwater, MN home is just too beautiful and colorful not to make the list. We don’t have a ton of information on it, but pictures speak a thousand words. 24. Willard Bunnell House – Homer, MN – Now a historical site only open for tours by appointment, the Bunnell House south of Winona has the distinction of being the oldest permanent residence south of St. Paul. This clapboard house is designed in the Carpenter Gothic style and features triangle-peaked windows and shutters, and carved bargeboards. 23. 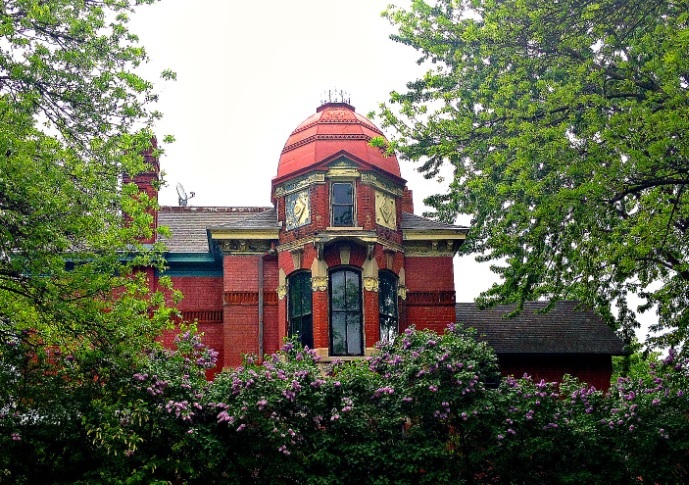 Edward and Elizabeth Heimbach House, St. Paul- Almost entirely obscured by trees in the summer, the Heimbach House is a colorful, Late-Victorian style brick house with an octagonal tower and dome and detached carriage house. It was built in 1890. 22. 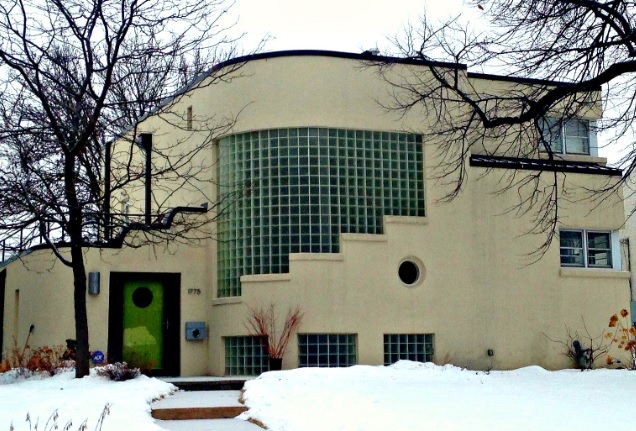 Abe Engalson House, St. Paul – The only Art Deco-style home to make our top 50, the Abe Engalson House in St. Paul’s Highland Park Neighborhood dates back to 1939 when the Streamline Moderne influence of the Art Deco movement was in its heyday, along with places like Mickey’s Diner and the Band Box Diner. 21. 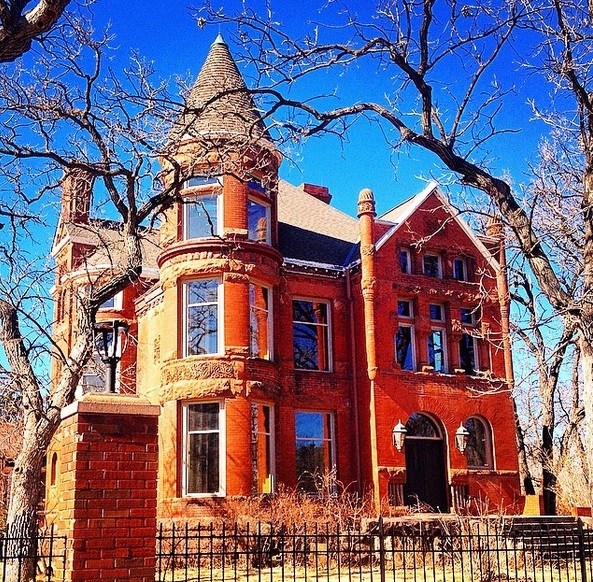 Driscoll-Weyerhaeuser House, Summit Ave, St. Paul – This castle-like stunner on Summit Ave was built by Frederick Driscoll of the Pioneer Press Newspaper in 1884 and is 11,000 square feet with 8 bedrooms and 12 bathrooms. It was once the residence of the owner of the largest lumber company in the world. It features a pointed turret and red brick construction and shades of Gothic, Victorian, and Romanesque architecture. 20. 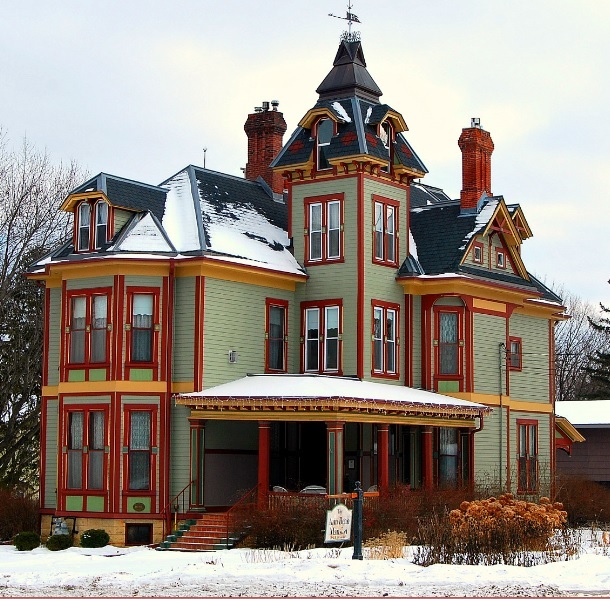 John Hutchinson House, Faribault – The gorgeous, multi-colored 1892-frame Queen Anne house was the original home of a prosperous furniture factory owner in the southern Minnesota town of Faribault. It is currently the Historic Hutchinson House Bed and Breakfast. 19. 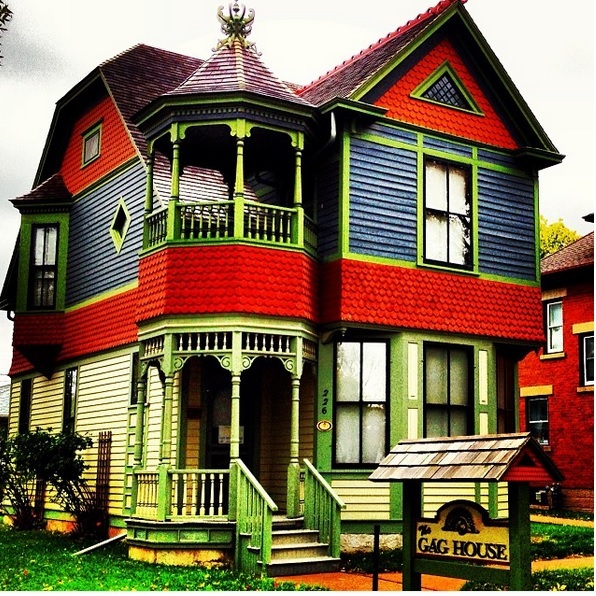 Diedrik Omeyer House, St. Paul – This colorful, quirky house in St. Paul’s Crocus Hill neighborhood was completed in 1889 by Norwegian architect Diedrik Omeyer. Marvelous at the time, it later fell into disrepair and succumbed to weather and complacent ownership, resulting in the removal of much of the ornamentation. Fortunately, the home was restored to its original beauty around the year 2000. 18. Charles Pillsbury Mansion, Minneapolis – The list wouldn’t be complete without the Mansion of Charles Pillsbury, who was the son of the founder of the Pillsbury Company. 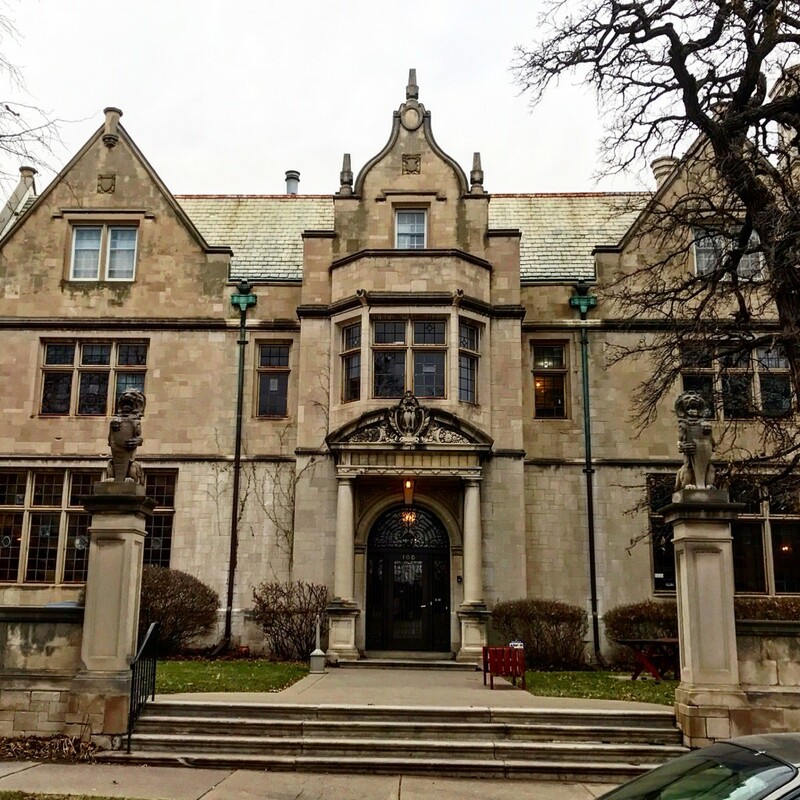 The historic mansion was built in the Tudor Revival style back in the late 1800’s, and is now a non-profit organization which provides services to the blind. 17. 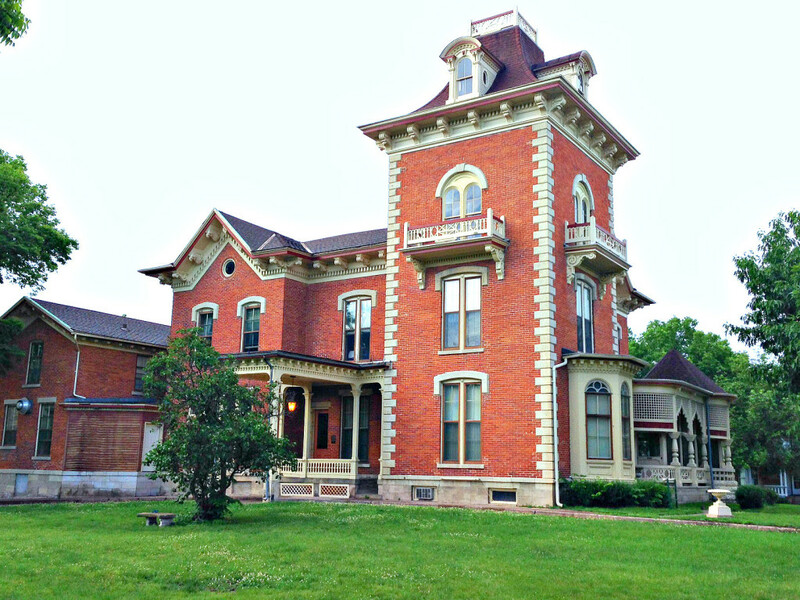 Lamberton-Huff House, Winona – One of Minnesota’s oldest and best preserved Italian Villa style houses, the Lamberton-Huff house was built in 1857 and given a Moorish Revival porch in 1873. Thanks to our friends at the Winona County Historical Society for providing us with some great photos of the house, and recently we were able to see it for ourselves. 16. George W. Taylor House, Le Sueur – The Taylor House in LeSueur is another significant style of the Eastlake movement of the late 1880’s. This pastel-green, incredibly-detailed house was the home of a local merchant and his wife, who at the time was the head of the Women’s Relief Organization. 15. 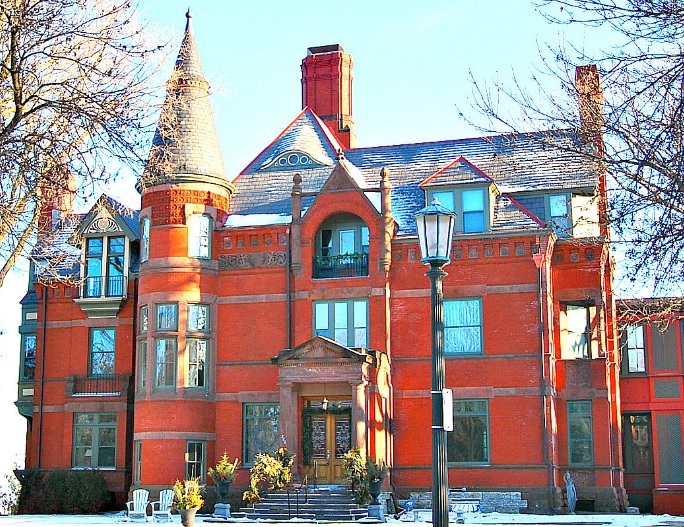 James J. Hill House, St. Paul – The largest and most storied home in St. Paul, the James J. Hill House is listed as a US National Landmark for its architectural and historic significance in St. Paul’s Summit Avenue mansion district. 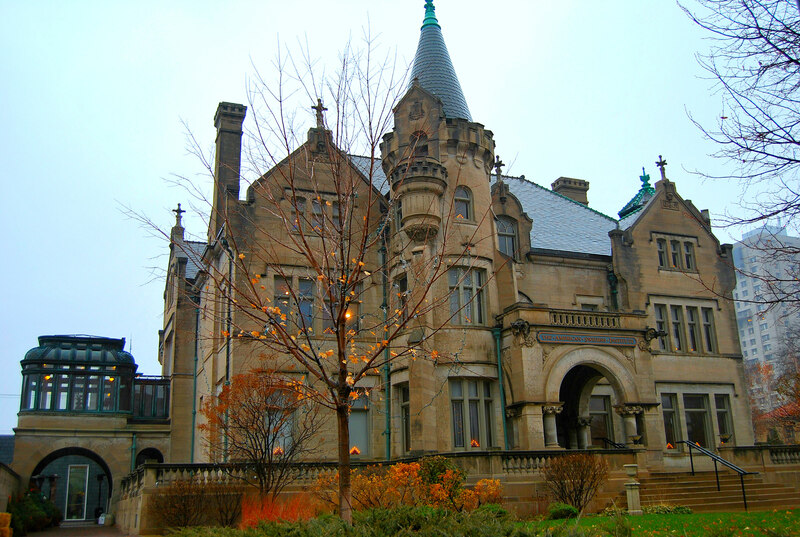 Built by railroad magnate James J. Hill in the 1890’s, it is now operated as a mansion museum tour by the Minnesota Historical Society. Like the Glensheen, much of its original decor has been preserved. 14. W.G. Purcell House – Minneapolis – One of the leading examples of Prairie School Architecture in Minnesota, which features long, narrow floors and sharp, angled corners, the Purcell-Cutts house near Lake of the Isles in Minneapolis is currently owned and maintained by the Minneapolis Institute of Art. It is available for tours each month. 13. 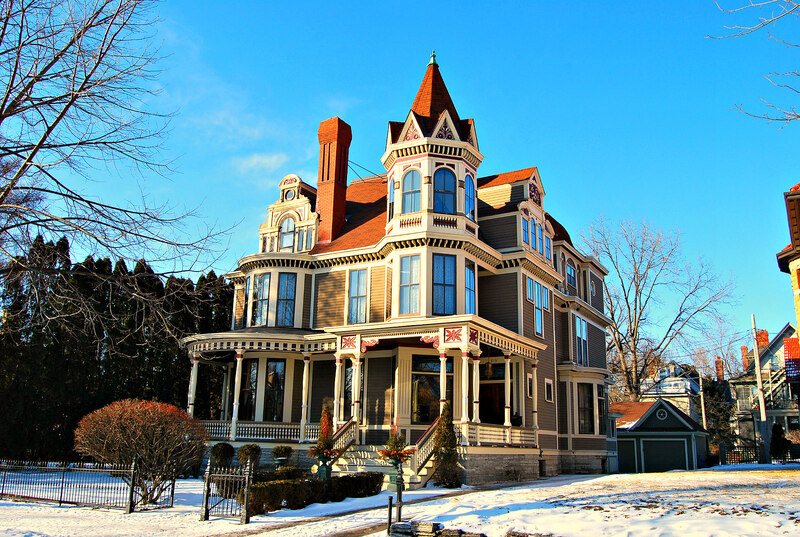 Ann Bean Mansion, Stillwater – The most beautiful home in the dazzing array of Victorian homes in Stillwater, Minnesota’s First City, has to be the four-story, Grand Victorian, Ann Bean Mansion up on Pine Street. It dates back to 1878 and is currently a B&B as well. 12. 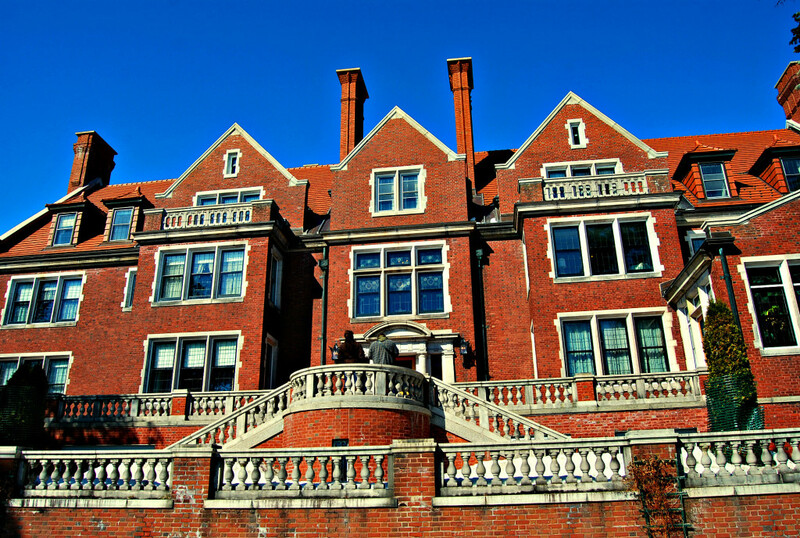 Glensheen Mansion, Duluth – It’s by far the most opulent, historic, and incomparable mansion in Minnesota- and within the walls is a real-life murder mystery tale. Set on the shores of Lake Superior in Duluth, the Glensheen Mansion’s lore is enduring and its architecture Jacobean. Almost everything inside is preserved as it was in the early 1900’s. It is currently owned and operated for tours and events by the University of Minnesota-Duluth. 11.Stanford Newel Castle, St. Paul – An honorable mention in our recent castles list, the Newel House in St. Paul originally did not feature the limestone-brick tower or parapets on top. The original home dates to 1864, with the battlements being added by Stanford Newel in 1886. 10. The Burwell House, Minnetonka – The Burwell House in Minnetonka was built in 1883 for lumber baron Charles Burwell in the Carpenter Gothic/Stick Style of architecture. The house, along with other original outbuildings are now a museum set on a beautifully landscaped property on Minnehaha Creek. 9. 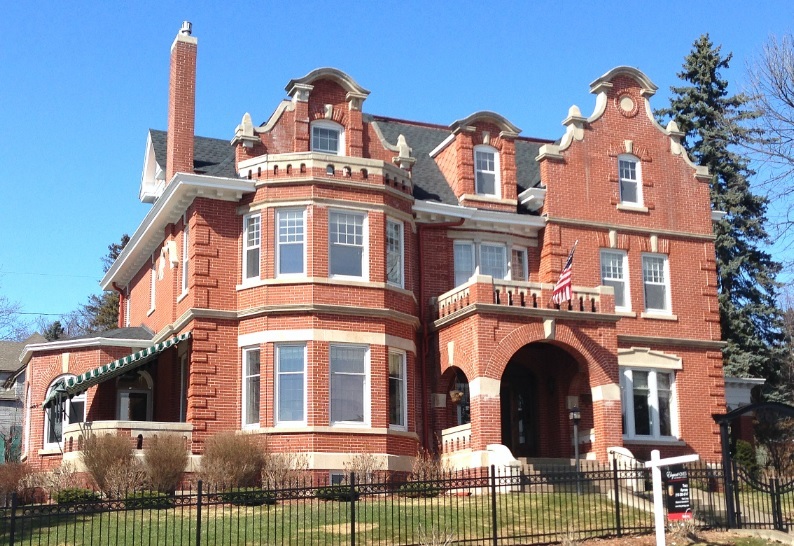 H. A. Paine House, Albert Lea – A mixture of Queen Anne and Tudor style architecture, the H.A. Paine house in Albert Lea sneaks into our top 10 due to its unique Bavarian look. It dates back to 1898 and is of course listed on the National Register of Historic Places. 8. William G. LeDuc House, Hastings – The LeDuc Mansion in Hastings dates back to 1865, when Civil War veteran and former US Commisioner of Agriculture William G. LeDuc, later an attorney, built this Carpenter Gothic home in Hastings on land he won in a lawsuit. It changed hands after his death, and sat empty for almost 50 years until the Dakota County Historical Society acquired and restored in in 2005. Now operated as a museum and facility for rent. 7. L.J. Gates House and A. Bettingen House, Woodland Park Historic District, St. Paul – This popular middle-class residential neighborhood exhibits 12 distinct architectural styles popular in Minnesota. 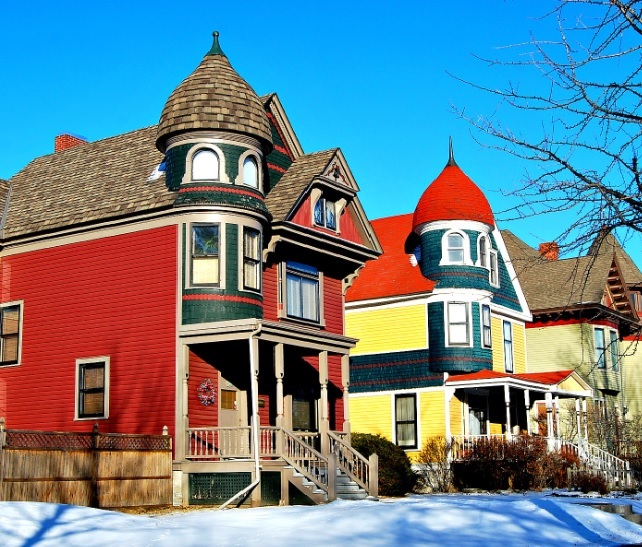 Found just north of the beautiful Summit Ave, most of the homes feature vivid colors, turrets, and gabled roofs. The Gates and Bettingen houses are a focal point of the neighborhood. 6. W.W. Bishop House, St Paul – Another grand Victorian home on Summit Avenue, the Bishop house is one of the more detailed and exquisite homes of the most beautiful street in all of Minnesota. 5. 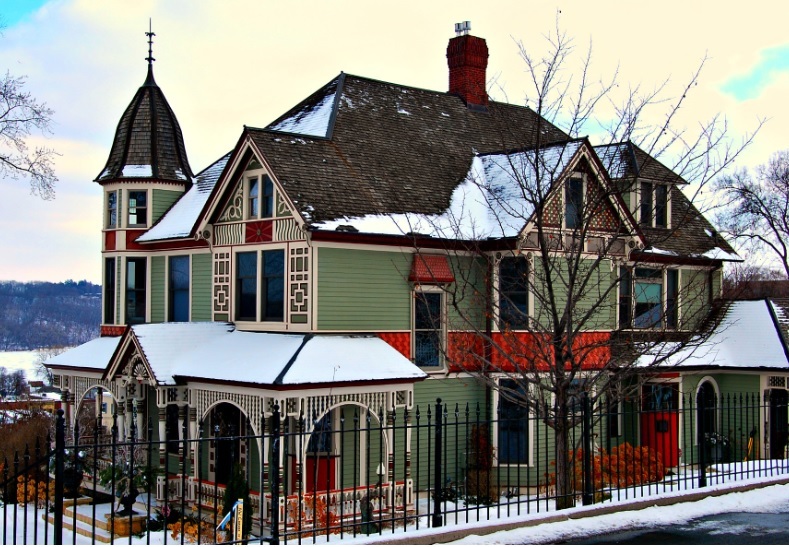 Burbank-Livingston-Griggs House, St. Paul – One of the first and most prominent examples of Italianate architecture in the entire state, this dazzling Summit Avenue stunner is one of the most beautiful homes in Minnesota. It was designed by Chicago architect Otis L. Wheelock and built 1862-1865 for James C. Burbank, a wealthy owner of the Minnesota Stage Company. It is the second oldest house on Summit Ave.
4. Bardwell-Ferrant House, Minneapolis – A brilliant display of Moorish and Exoticism Revival architecture, the Bardwell-Farrent House was actually originally designed to be more of a Queen Anne-Victorian house. Roughly 7 years after it was built, an architect added the onion domes, spindlework porch columns, and stained-glass windows to give it the look it has now. The house was later moved several blocks away to its present location. After a recent foreclosure, it has a new owner who has thankfully restored it. 3. 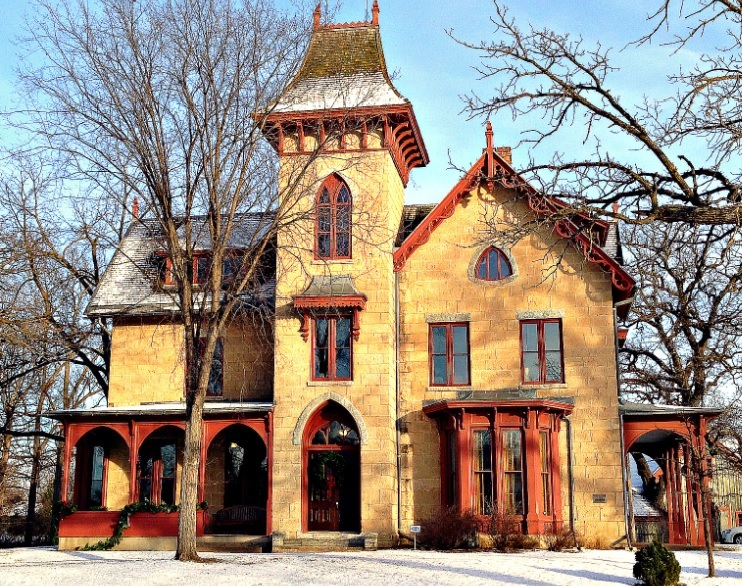 Schell’s Mansion, New Ulm – This gingerbread house tucked back in the hills outside of New Ulm on the Schell’s Brewery grounds was once the home of August Schell, founder of the second-oldest family-owned brewery in the US, after Yeungling. Although the mansion itself is not part of the tour, it can be viewed from all sides as peacocks meander around you. 2. 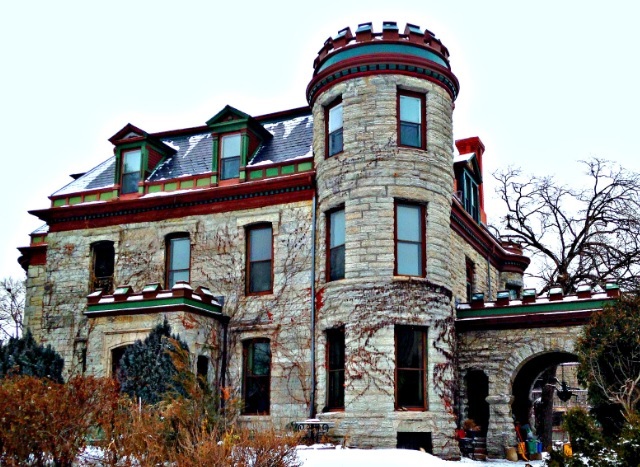 Swan Turnblad House, Minneapolis – Probably the best example of a real castle in Minnesota is the Swedish American Institute in Minneapolis. Built in 1910 by immigrant-turned-newspaper-mogul Swan Turnblad, the chateau-style mansion was later donated to the Swedish American Society and is now a museum. 1. Julien Cox House – St. Peter, MN – Built in 1871 for St. Peter’s first mayor Eugene St. Julien Cox, the most beautiful house in the state isn’t especially large. But it’s beautiful, a light yellow with red trim. It’s unique, built in the Carpenter Gothic Style; and charming and exotic and the very reason lists like this exist. Kudos to you, St. Peter. Did we miss any? Let us know in the comments which homes you’d like to see in the next 51-100 houses installment! *Special thanks to everyone who provided photos, information, and recommendations, and to my troops on the ground who grabbed photos for me when I couldn’t get them myself. This list was by far my most contemplative and ambitious article yet. And to my wife for always putting up with me stopping every chance I got to snap a photo or ten. Awesome! Fabulous!! Downright great!! Thanks Seth!! Thanks David! Glad you enjoyed it. the coolest house in Minnesota is Ensculptic. The Lammers House, Stillwater, MN, 1306 3rd Street South. Beautiful, painted lady, Victorian, 1893. 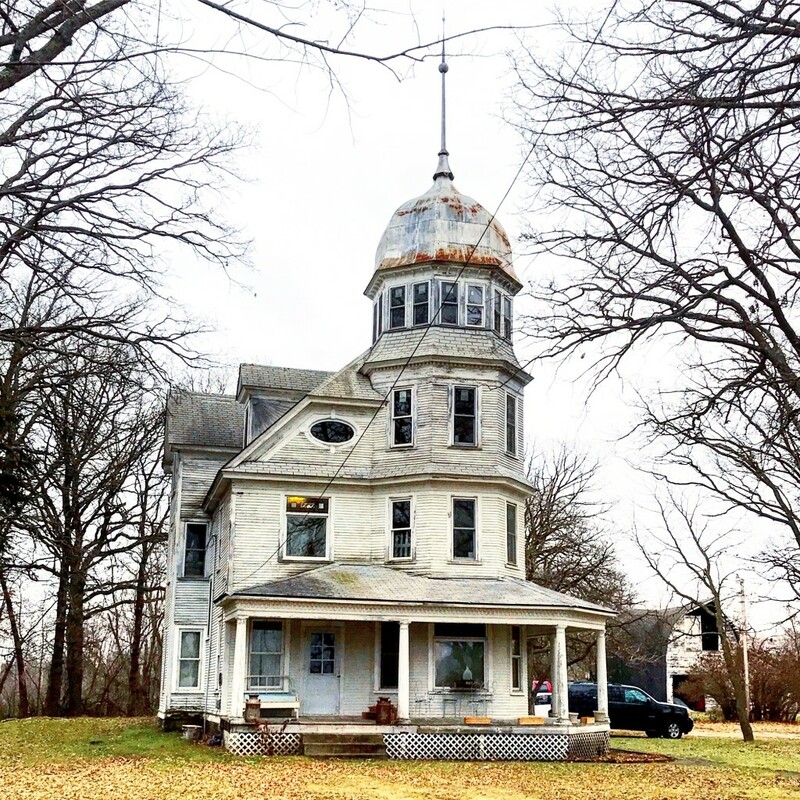 Built by the lumbar baron, Lammers, after proposing to a young woman, turned down, and built a house on the hill so she would see what she was missing every time she left town. We just toured historic Frontenac and saw some beautiful homes there. Apparently the entire town is on the National Historic Register. We will definitely go back in the spring to see the lilacs and take a walking tour. The spelling is Weyerhaeuser or Weyerhauser. You might want to check out Placeography.org Nice website, though. Thanks. Thanks for catching that, I corrected the spelling error. Thanks for reading! Bravo to this collection. But might you add 315 Pine St, Hasitngs, Mn. Now Thorwood Rentals & Retreats but on National Register as Thompson Fasbender House. -First a home built in 1880, then a hospital 1912-1953, then a six plex 1953-1979, then a B &B and now an R & R (vacation rental condos). Many historic properties now serve as inns, B & Bs and would make an interesting grouping as people can stay overnight and enjoy their history and preservation. The industry is commendable for preserving and saving as many homes from the late 1800s in America as it has. There are some that quite literally would not be if it were not for the spirit of preservationists and B & B travelers. I enjoyed seeing these houses. I was surprised that there weren’t any from Rochester. There are many beautiful historic homes there. Also, Lanesboro has some nice homes. Interesting… but there are so many other styles worthy of mention… there are some amazing architect designed mid century houses in Northfield that I drool at on a daily basis. (932 Greenvale I think is the address of my favorite) and tons of more great mid century houses all over the metro area. My fav house on Summit is a smaller unassuming brick house with a beautiful terracotta curved clay tile roof. 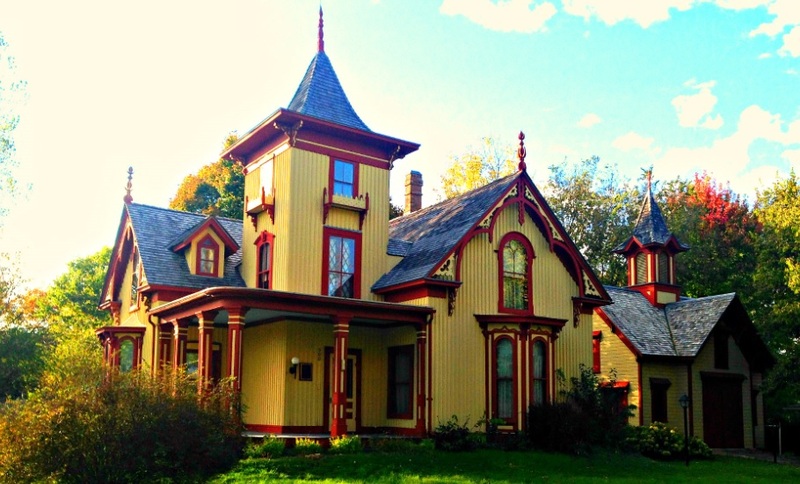 There are many beautiful houses in Lanesboro that you should check out, if you haven’t already. And MANY homes in Tangletown. Check out the Kremer House and Library in Minnesota Lake, MN. 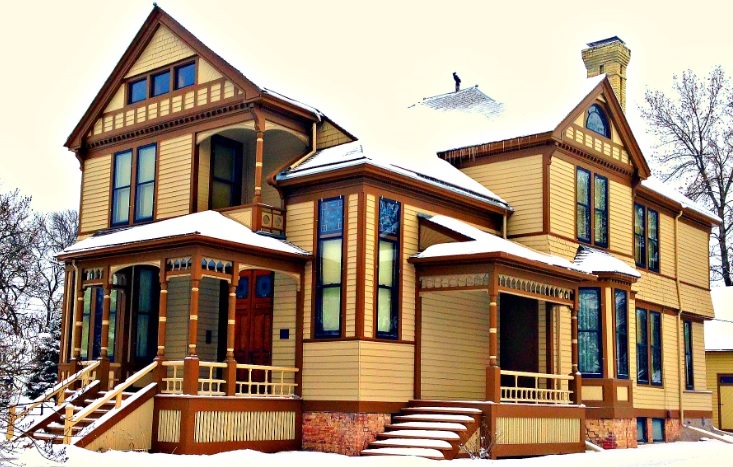 There are a number of historic / beautiful homes in the Lincoln Park neighborhood in Mankato. I wanted to include the Lorin Cray Mansion in Mankato but just couldn’t squeeze it in. Next installment though! 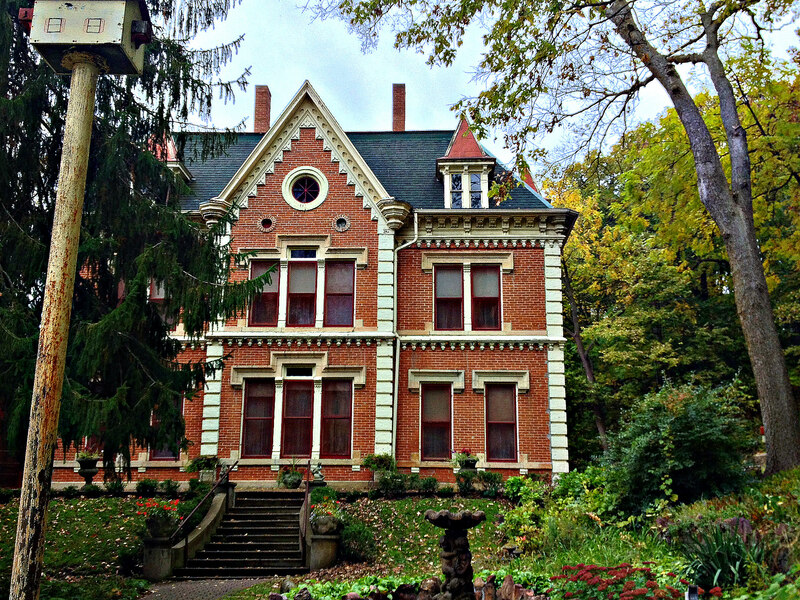 The Wohlhuter Mansion in Fairmont on Woodland Avenue. 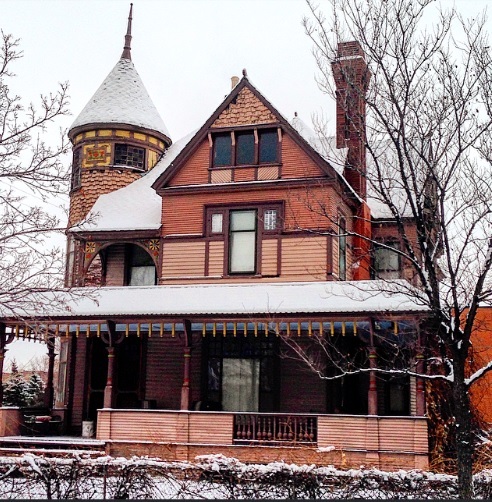 Disappointed that the Plummer House in Rochester did not make your list! Should be “Muench” in 46. Thanks for letting me know, it has been corrected! As a kid from Mountain Lake, MN #31 was fascinating. I would see it every school day morning on my way to and home on the bus. It really is an interesting place. I would love to tour the inside sometime! Thank you Seth for including the Historic Hutchinson House B&B as the #20 Coolest House in Minnesota . . . we are truly honored! The house is on the National Register of Historic Places, but the most exciting tidbit is that the “average Joe” can actually experience the house, as it is a bed & breakfast. We invite your followers to make a reservation today, and if they mention your article, we will offer them a 10% discount. Of course! Thanks for sharing the photos and we think the discount idea is great! The Sheldon Mansion originally had 3 floors. Sometime around 1960, the owner at the time was unable to finance the repair of the Mansard roof (due to water damage) so he removed the entire third level of the home, forever changing the home from Second Empire to Italianate. The ballroom and servants quarters were on the 3rd floor. Very cool old photo, thanks for sharing! It would also be fun to see a post with all the homes of famous Minnesotans, such as Charles A.Lindbergh in Little Falls, Maud Hart Lovelace in Mankato, the Mayo house in Rochester, the Ramsey House in St. Paul, etc. I saw some listed above. I enjoyed your houses. Maybe touring around western Minnesota, stopping in Fergus Falls (Vernon Ave, and around Lake Alice) and Pelican Rapids (home near the high school and driving east on Hwy. 108, a couple more before you leave town) you would find several more interesting homes built by early residents of these towns. I have photographed that Italianate-style house by the High School in Pelican Rapids and actually considered it for the list. There are two in Fergus Falls that will certainly make the follow-up list. There is a house in Minneota with a turret, built by the same architect that built the state capital.. Missing any of the SE MN houses. Hubble House, Plummer House, Mayowood Mansion, etc. Check out the Korda mansion in Pelican Rapids, MN! Is this the house that was formerly owned by the Metcalfe’s ??? Can’t remember where they lived, but I do remember it was a really cool house! The Christie Home, Long Prairie, MN! 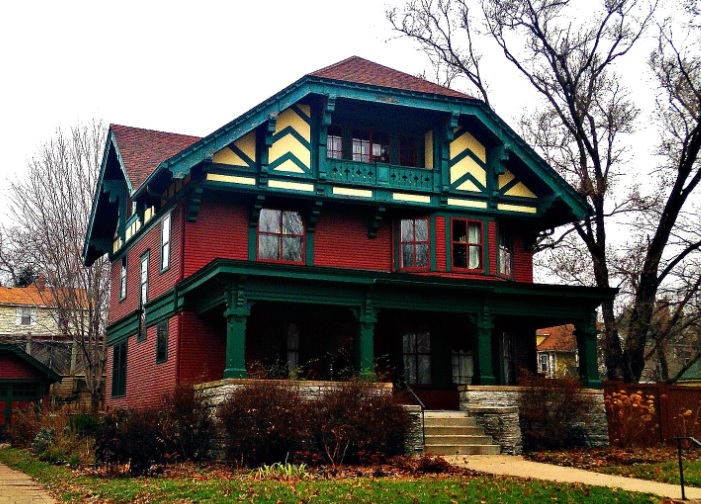 1901 Queen Anne style home lived in by one family and contains all original furnishings. Currently operated as a museum. How about the historic Vasa Children’s Home? Great list. I grew up in Winona and was sorry to see only one of the many, many beautiful homes there on the list. Hopefully 51-100 will be more out state homes. Great photos. Love that these places have been preserved. Lanesboro has some amazing homes – check them out! David Park House 1501 Birchmont Drive NE, was built in 1937 in the Streamline Moderne style, a variant of the Art Deco style. At 5,300 square feet, the home was constructed with poured, reinforced concrete. The house’s most dazzling feature — a sweeping curved staircase extends from the basement to the second floor. Great list. Thanks for taking the time to research the great homes in Minnesota. 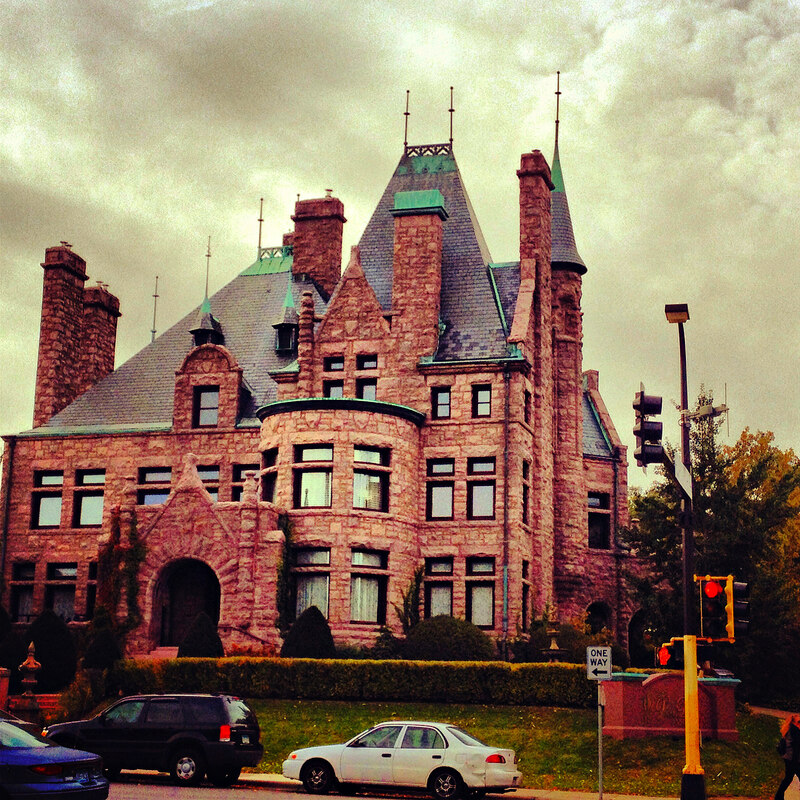 A suggestion for your next list is the Eugene J Carpenter Mansion at 300 Clifton Avenue in Minneapolis. What an Awesome List! Talk about a Great Road trip in our beautiful State of Minnesota! Plus all the added houses that readers have suggested. I want to print up a list, and zig zag the state just to see all of them! Great Job on the 50 + great Houses in Minnesota article!! Looking forward to seeing the next 50+!! -Waller house, beautiful painted lady that is currently a B&B. -Weyerhaeuser & Musser Mansions of Linden hill museum and event center, both homes sit exceptionally close to each other and were both designed by Clarence Johnston for the managers of the Pine Tree lumber company. The Dewey-Radke house would have been great for your list but unfortunately the city of Little Falls razed it in 2009 for a parking lot that still does not exist. Check out High Street and Oak Street in Lake City. Some of the best historic architecture in the State. When you consider the home, setting and view, these are hard to beat. You won’t believe what is one block off highway 61. Personally, I always really love homes that are unique and/or themed, so I would have to say that 31 and 35 are my favorites. With 35, I would turn that into a medieval themed luxury home. It would be even cooler if it had a lot of the fancy gadgets that we have today and try and show it as magic. I’m sold, I need my home to be a wizards tower sort of thing! Who knew there were so many beautiful homes in Minnesota. What a great collection! Thanks so much for taking the time to compile this great list. You’re welcome, and thanks for reading! 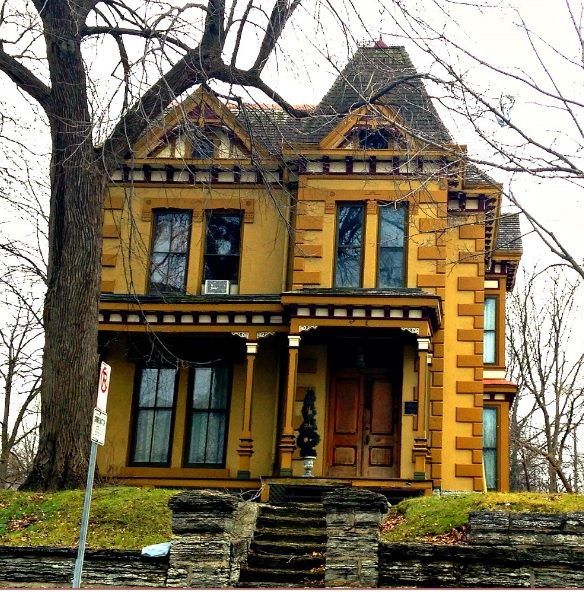 #100 Blyberg House – thanks for the shout out. National Historic Register, and you were correct, it is currently on the market and available: MLS 20-3525. I included one in the next Top 50. Mayowood, located outside of Rochester. Built in 1911 by Charles H. Mayo, one of the two brothers who founded the Mayo Clinic. It is owned and operated as an interpretive center, with tours offered year round (most popular are the Christmas tours!). The Plummer House, also in Rochester, is an English Tudor mansion and has a beautiful water tower visible from the highway below. 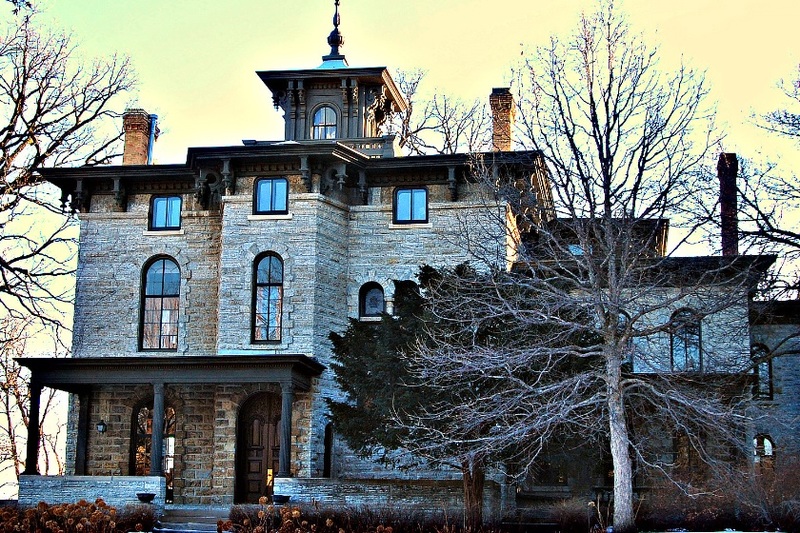 The Plummer House was home to Dr. Henry Stanley Plummer, another Mayo Clinic partner and founder. I did include the Plummer House on the next Top 50. The Mayowood Mansion is still a bit of a wild card for numerous reasons. Probably too late for the next round, but I think you should include the house on Gallagher’s Island in Magnetic Lake. Agreed about Gallaghers Island on Magnetic Lake…but then again I’m a little partial as the caretaker! Marshall Avenue, Litchfield, MN, has an art deco house, unique in the town, which also has many notable old houses with wonderful style. 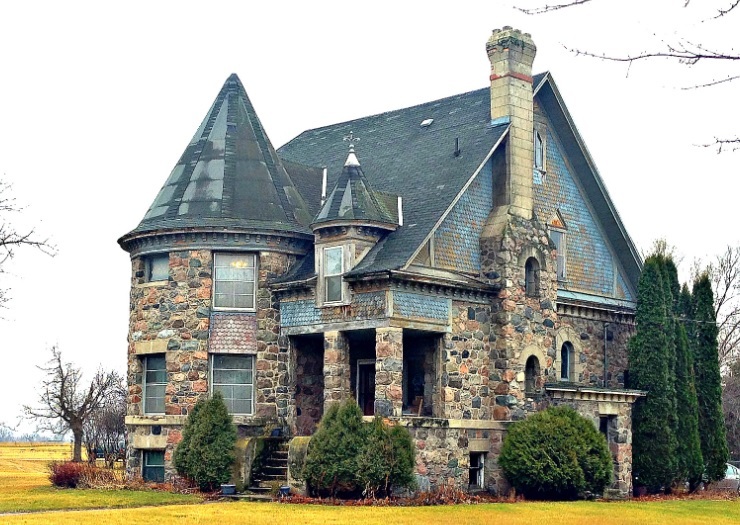 I always laugh when I see or hear the Schell’s Brewery house called or listed as a mansion. Most people would not consider it one. It’s ugly too. I can’t figure out how it made this list, but there are a bunch of houses on here that I don’t appear to be all that beautiful or intriguing, in all honesty. Some are pretty, but I was disappointed, after making it all the way through this list, to find so many of the houses were nothing special. This was awesome! Thank you! You should do one on just Stillwater homes. Although you might have a hard time narrowing it down to your top 50! Terrific list, though I believe the James J Hill home is more opulent and structurally Superior than Glensheen. Have you checked out the Mayo Foundation home? It is the home of William J Mayo , brother of Charles Mayo(Mayowood). A stunner in downtown Rochester but only open to Mayo Clinic donors and private functions. Thank you so much for your research and dedication. The “Big White House” in Anoka is pretty nice. It’s now an antique store, and it’s adjoined to a Masonic lodge (creepy). The address is: 1900 S 3rd Ave, Anoka, MN 55303. 1150 wyndmere road in Orono. Great list and pictures. Thank you for sharing. Regarding # 37, Albert Lindeke’s wife was not Carol. It was Louisa Schroer Lindeke.